You’ve put years of hard work and dedication to earn your degree or diploma, you’ve had the opportunity to walk across the stage and celebrate, it’s now time to pick a frame to showcase this amazing accomplishment! Whether you graduated moments ago, or have kept your degree/diploma in a safe place over the years, it is never too late to get it framed. 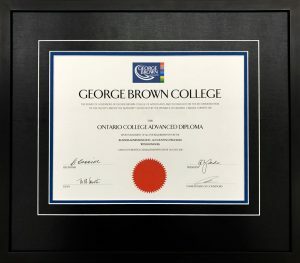 As our way of saying congratulations, we offer a degree and diploma framing special year round. With hundreds of samples to choose from, we can incorporate your school’s colours, compliment your home or office interiors, but most importantly, create something that you will feel proud to hang on your walls. You have worked hard for that piece of paper…..it deserves to be properly framed.